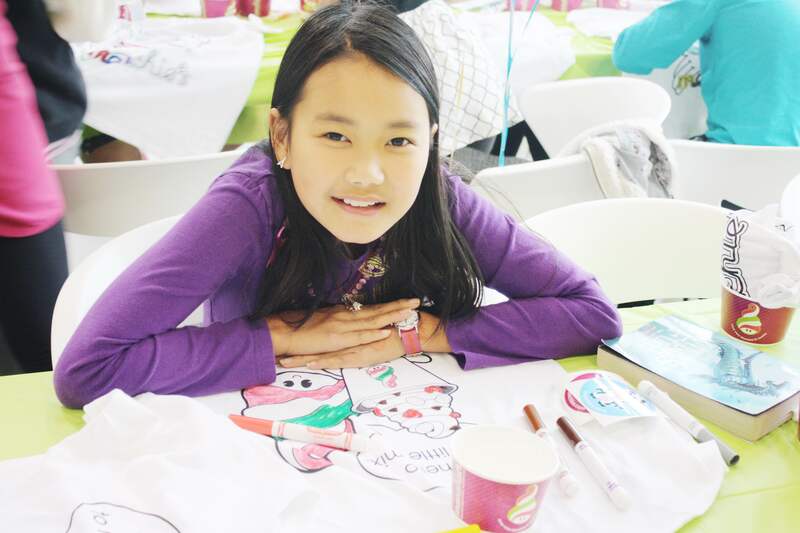 Last year, I did an at-home party for my daughter and truthfully, I found it was a lot of work and a huge mess! For this reason, we decided to do something outside of the home this year. 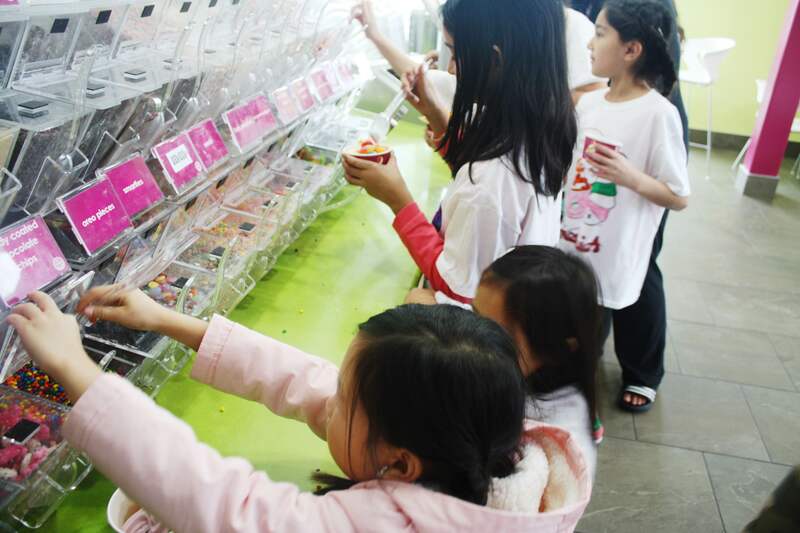 We ended up choosing the new Menchies in the Fremont Village in Port Coquitlam. My girls love going on dessert dates to Menchies, so when I found out they host parties, I immediately contacted them. The night before the party I felt like I was missing something. I’m so used to running around like a chicken with my head cut off in preparation for parties. That said, this feeling of “I must be forgetting something” kept hitting me with pangs of anxiousness. The morning of the party I went out and grabbed a giant number 9 gold foil balloon, to ease my “I should be doing something” worries. 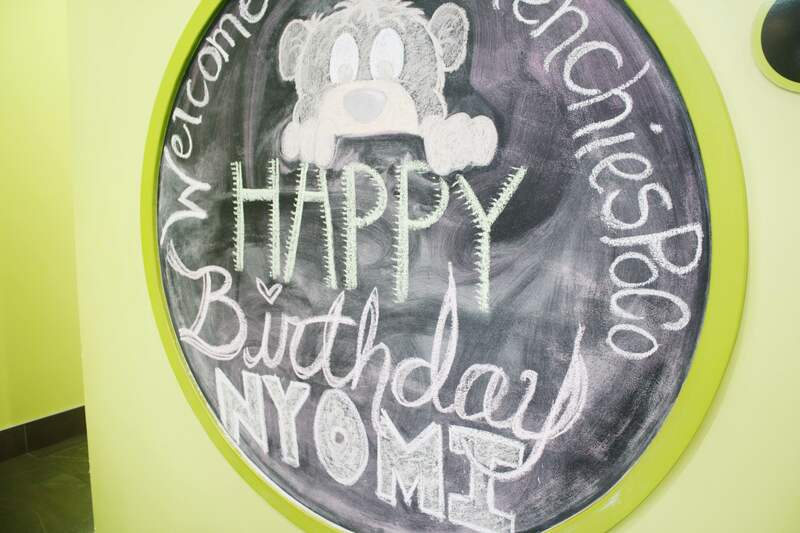 However, when I arrived everything was set up, including… balloons and beautiful chalk art!! 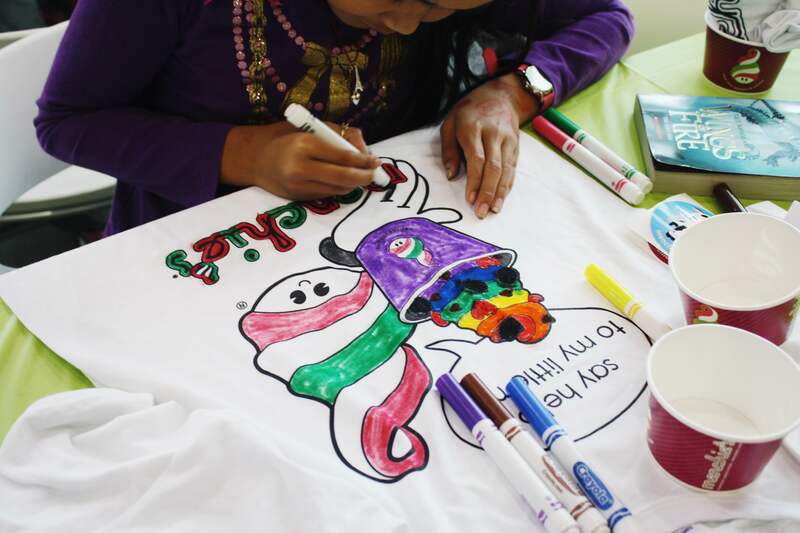 When the children began to arrive, the friendly, enthusiastic party hosts introduced themselves, and encouraged the children to color their very own Menchies T-shirt. The parents were given the option to stay or leave. Most of them decided to go out for lunch or shop around for an hour and a half in the village. After the children finished up their shirts, the part hosts gathered the children for a couple of rounds of musical chairs. The children went from quiet and concentrated, to rowdy, and excited!! After the children finished up musical chairs, they went and washed their hands for pizza and juice. The kids were pretty hungry at this point, so getting everyone to sit and eat, wasn’t a problem at all. 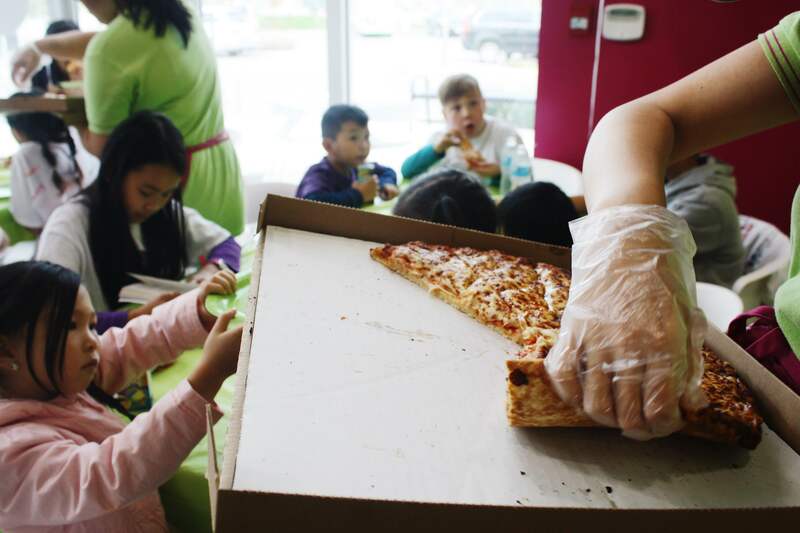 The party hosts called each child by their name while handing out pizza and juice. I was so impressed! The pizza was included in the party package and man, did it ever look good! After pizza, came dessert! The children pretty much ran up to the yogurt bar after the party hosts gave them their cups. They were free to choose any flavors and toppings they wanted! 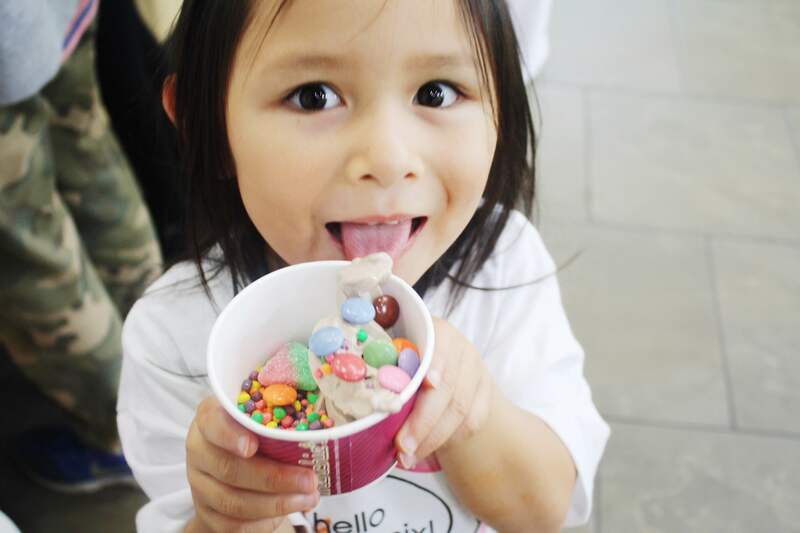 After dessert came the biggest surprise of all…a visit from Menchie himself!! The kids jumped up when they saw him with excitement!! We took some group photos, and Menchie signed their t-shirts. My girls told me in the car ride they had the best time ever and my daughter mentioned it was ‘waaaay better’ than her party the year before. The party I slaved over decorating, shopping around for supplies, entertaining, and cleaning up afterwards. 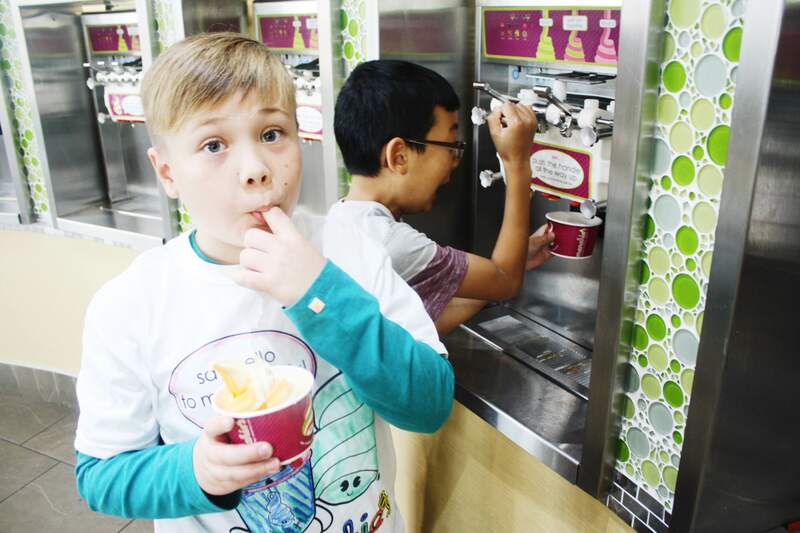 Yup, the party at Menchies totally beat that party. And, in all honesty, it was SO nice to simply ‘show up’. In my opinion, it was ‘the best party ever’ too! The party was suitable for all ages. Just look at how happy this 2 -year- old was! 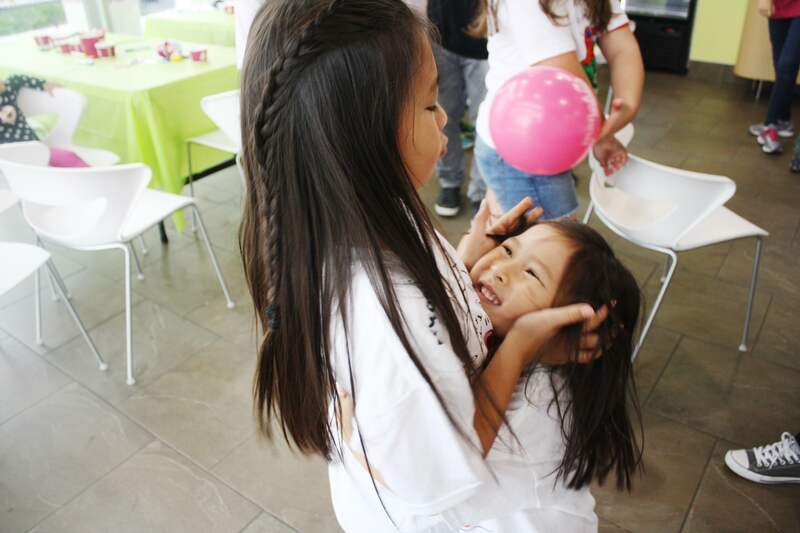 The children left full of smiles, and… goody bags! Yes, they even did the goody bags 🙂 The party hosts were spectacular, patient, and above all, they made the party super fun for the kiddos. 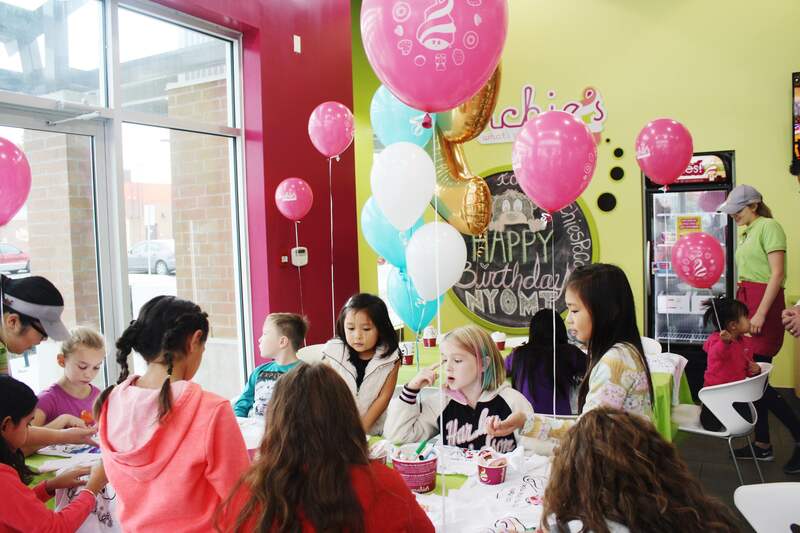 If you would like to simply ‘show up’ for your child’s next party I highly recommend booking at Menchies in Port Coquitlam. 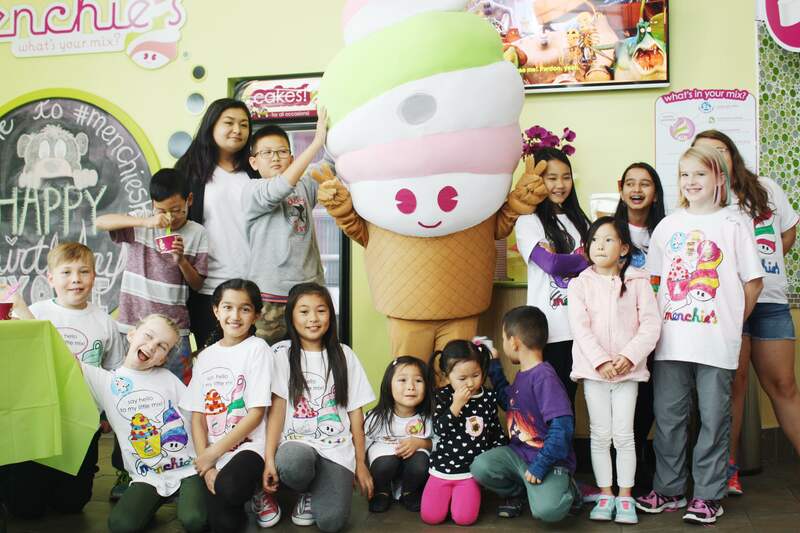 Birthday parties run 1.5h, with 1 menchie’s party host (per 8 children). On weekends, parties start at noon. 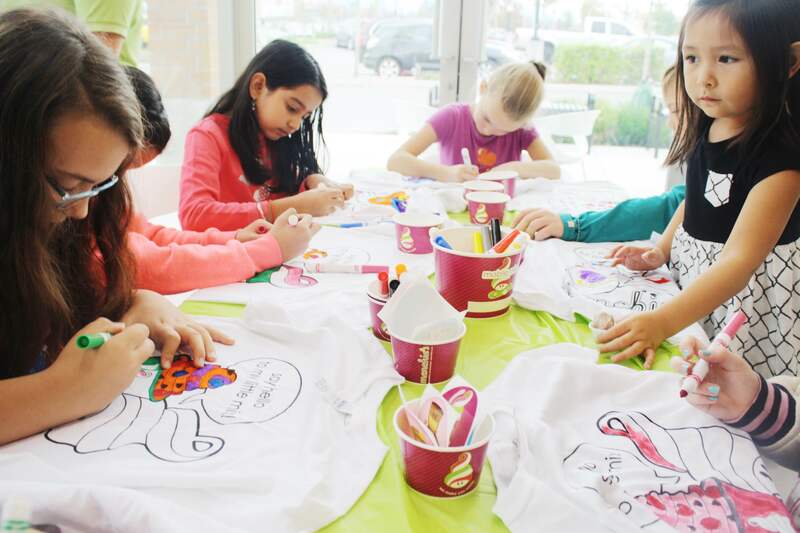 Each child receives a menchie colouring t-shirt, a goody bag filled with menchie’s merch (menchie’s pencil, button, stickers, tattoos, coupon, lip balm), and of course an 8oz party size cup of yogurt for them to fill on their own. 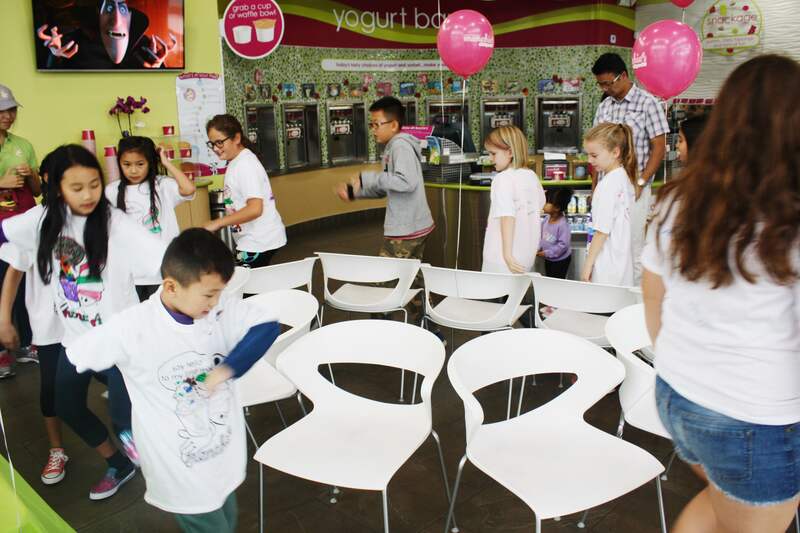 The menchie’s party host(s) will conduct fun activities and games best suited for the party’s age range, and group size. 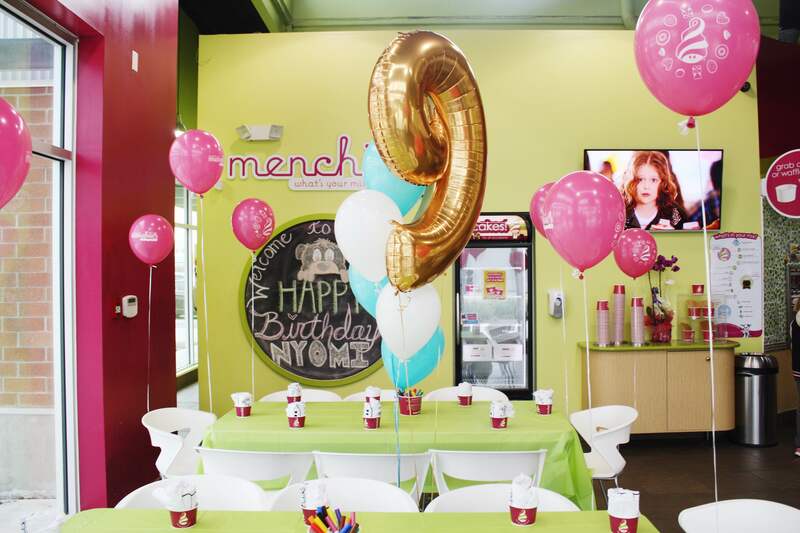 Menchie’s host will take care of party set up, decorations and clean up. 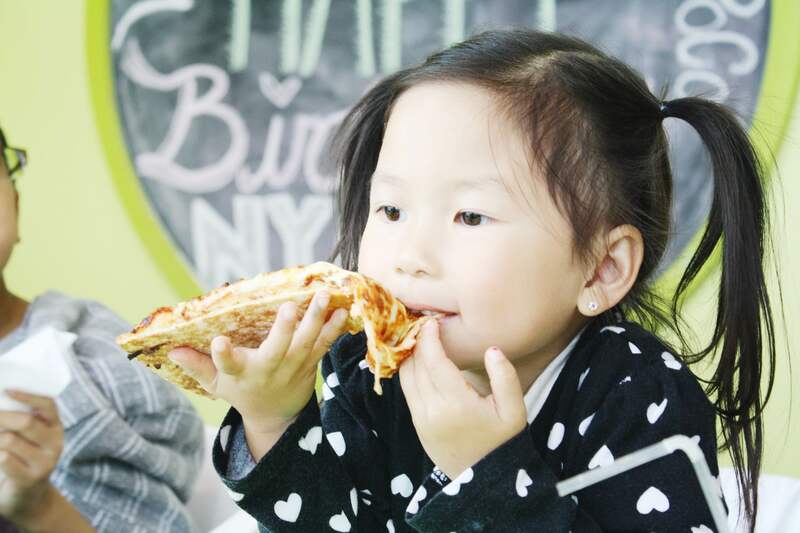 With the addition of $5 per child, each child receives pizza (cheese/pepperoni) and a drink (juice/water). 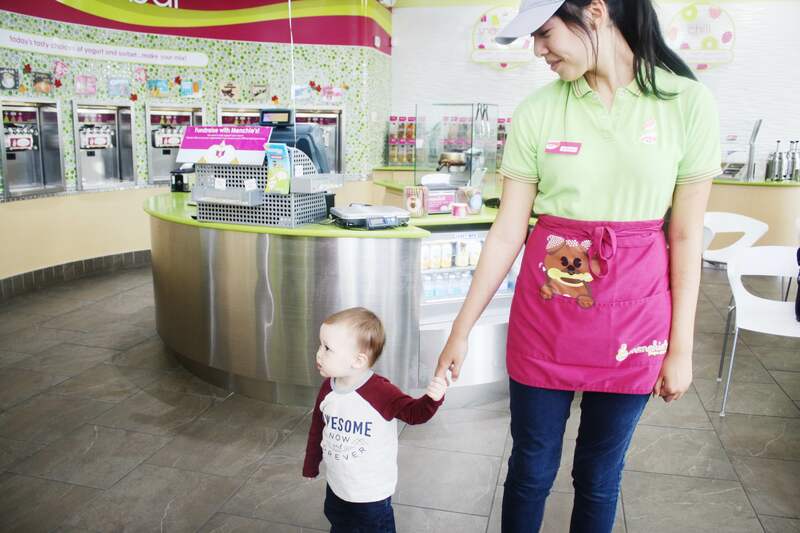 Best of all, all party guests will meet and take pictures with Menchie, our smiley shop mascot! Cakes are usually $29.99, but are $25 with birthday add on. 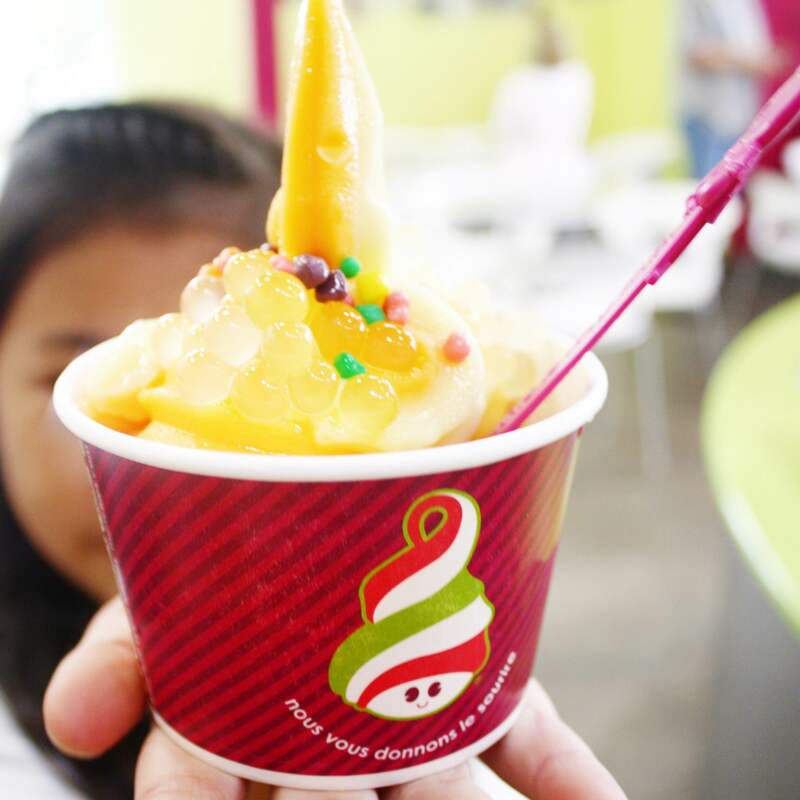 Custom create a unique and delicious frozen yogurt cake by choosing flavours and toppings that are currently mixing in store. 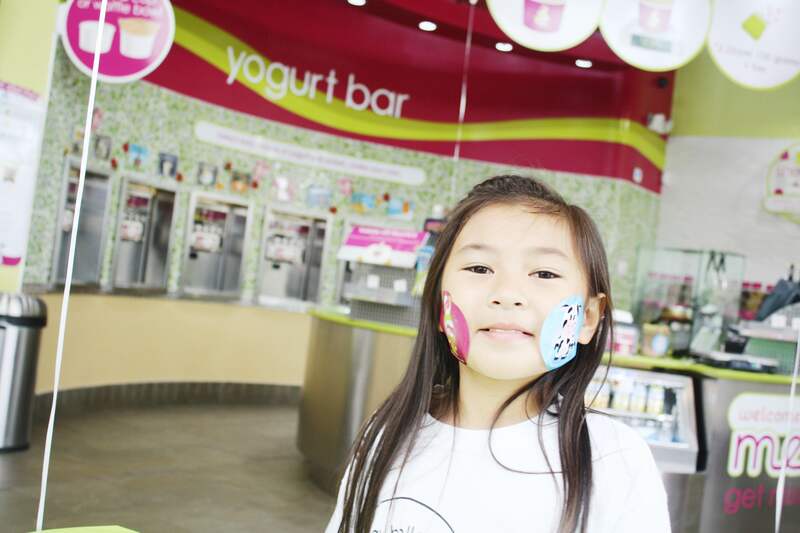 Mention ‘STYLING THE INSIDE’ if you decide to book your child’s next party at the Port Coquitlam location and receive 15% off the entire party! 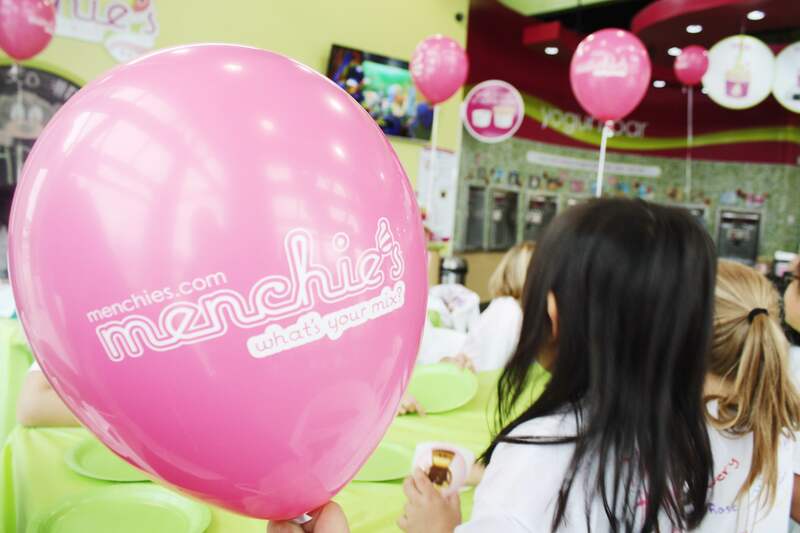 And don’t forget to get social with Menchies Poco. Thanks for reading friends, I hope you have a sweet day! Disclosure: This is a sponsored post. All opinions expressed are authentically my own. Looks like it was lots of fun! Do you think I should have my 30th there? 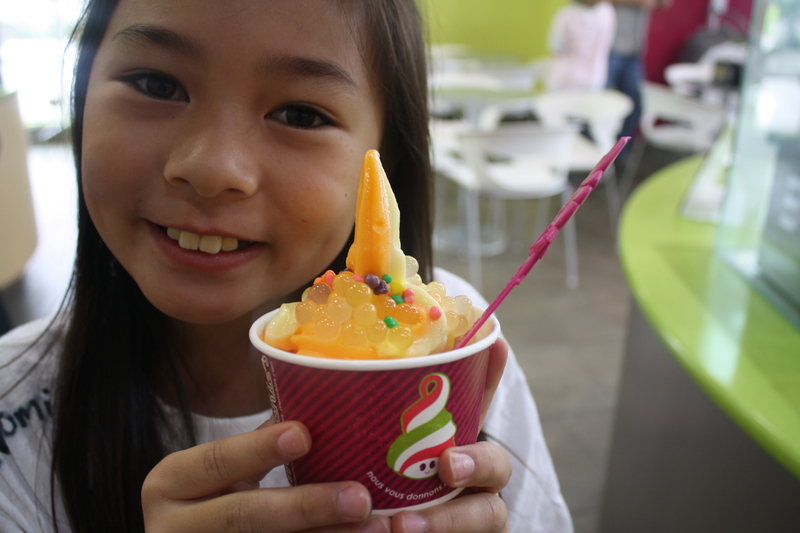 I do like frozen yogurt, lol!